This was a Celebration of the life works of Molly Badham. The event was an exhibition and presentation of the work of Molly Badham. The guests arrived through aluminium Entrance Doors in to a 30ft x 90ft Marquee. 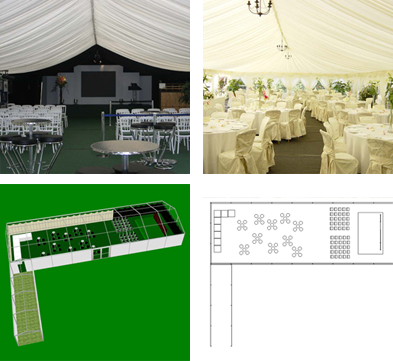 The decor of the Marquee consisted of Ivory pleated linings with a Bottle Green swags for two thirds of the marquee with the remainder lined with a black out lining, to assist with the large screen presentation. The Marquee was carpeted with new Bottle Green marquee carpet on an interlocking Boarded Floor, and had a large stage (carpeted) at one end with a presentation screen. Refreshments were served to guests seated at Aluminium ‘poser’ tables with high level bar stools. The caterers serviced the event via a 10ft x 40ft walkway to the main building.